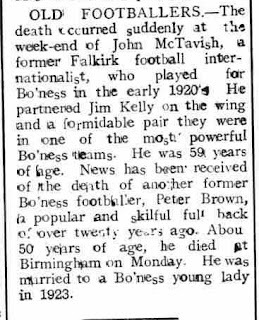 Yet another East Stirlingshire starlet I know little about, yet featured in the Falkirk Herald's "Prominent Players" series. As far as I can ascertain, Robert also succumbed to the curse of ESFC players apperaring in this series, because from what I can see of his career after this point, he went out on loan to Alloa Athletic for the next season [1907/08], then dissappears. Continuing the Falkirk Herald's "Prominent Players" series of 1907 this time it is William McAulay Falkirk's Inside-Left for the 1906/07 season. By the time William joined he was already a veteran of top flight football, both North & South of the Border, but he was by no means past it. After a season with Falkirk he moved to Hibernian before winding his career down at Alloa. 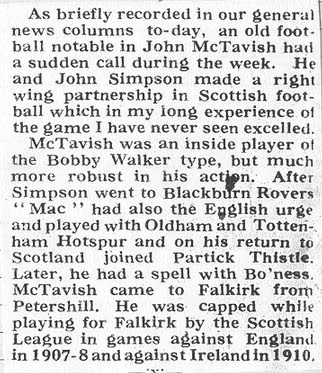 The great John McTavish paired up with John Simpson to create one of the greatest right-wing partnerships in the history of Falkirk FC. Interestingly the two players careers match well, both joining Falkirk at about 1905 from junior football, both leaving in 1910 to go on to successful careers down south, and both players making slightly over-the-hill comebacks for Falkirk during the First World War. However there was no doubt about the nationality of McTavish [Simpson was born in England], thus the Scotland selectors were forced [then as now unwillingly] to pay attention to a "provincial" player. After his football career was over Jock went in to management with East Stirlingshire, however it was brief and he returned to the world of work, settling in Camelon for the rest of his days. One of those players that was once 'famous' but now largely forgotten, William Morris played over 200 league matches for East Stirlingshire between the turn of the Century and the outbreak of the War. As with most long-serving players he was a local lad. Willie Raisbeck came from a Slamannan/Larkhall football dynasty: the Raisbecks produced several footballers at the turn of the Century. Born in Wallacestone [and not Wallacetown, Ayrshire like it says on his Wikipedia entry], he grew up in Limerigg before the family moved to Larkhall, where he "entered the footballing fraternity". After his Falkirk career he moved to Alberta, Canada, where he may have played with Lethbridge FC. Emigrated to Canada, sailing from Liverpool to Montreal on the 20th May 1907 on the Ionian. The latest subject of the Prominent Football Players series, Hugh McDougal was a Highlander [hailing from Kilmallie] who had moved to the Central Belt to take up teaching. Making him one of that rare breed of footballers: the amateur. In itself that is no bad thing, but the truth of the matter is that most amateurs had to spend most of their time doing, well, a proper job, instead of practicing or training; frankly improving. This in the long term usually means the amateur player in a professional football club becomes a bit part player. Another effect is that the player goes where the job takes them, and this was the case with Hugh, after a season with Falkirk he moved to Dunfermline Athletic, followed by spells at King's Park, Stenhousemuir and ending his career at East Stirlingshire with the outbreak of the Great War. All of these moves dictated by which teaching positions he took up. It is hard to gauge his career today because most of his career was spent with non-league teams who are now league teams. Another East Stirlingshire player, another player who seemed to come under the Falkirk Herald's East Stirlingshire/Prominent Football Player Curse. As in I find no record of him after this season. It could be for many reasons, he could have been injured, he could have moved abroad, but the simple fact is Peter Murdoch of ESFC was lost to history. I suppose when the Falkirk Herald decided their Prominent Football Players it must have all been relative, because some of the players have largely been forgotten to history. Or perhaps they were more celebrated in the district back then, no television etc. Like many of the other East Stirlingshire players I have reproduced from the Prominent Players series today's player John Reid seems to dissapear shortly after the Falkirk Herald lauded them. Since I am no expert on the careers of East Stirlinghsire players it would be wrong for me to comment on this. Anyway here is John Reid Captain of East Stirlingshire. Another East Stirlingshire player that I don't know much about over and above what is written below. Not only is it not my team, it is more than a Century ago. I can find no record of him at another Scottish League team, but then again I do not have the complete records. Unlike his big brother 'Jock', Robert McTavish did not really get a chance to prove himself in what must have been one of the best Falkirk FC sides of all time. One of the main reasons for his not getting any chances was simply down to that fact that his 'natural' positions on the right wing were taken by the legendary Jock Simpson and his own brother. This meant that most of his games for the first eleven ended up being at Centre-Forward or Outside-Left, but his performances at Outside-Right for Falkirk 'A' kept him in contention for a place come injury or suspension. Here is another Prominent Player from Falkirk District in 1907, this time a 'shire player James Macrae, which means I really do not know that much about him. Read the bio I say. This post from the prominent footballers series is that of James 'Punkie' Reid. Another local lad who Falkirk pinched from East Stirlingshire twice. Although starting his career at Inside-Right, in his second spell at the club he played almost exclusively at Right-Half, to such success that in 1907 he played in the Scottish League International Trial, then in 1909 in the Scottish International Trial, sadly though not being given the honour of representing his country. After his Falkirk career he moved on to Cowdenbeath, then served in the Great War with Argyll & Sutherland Highlanders. This the legend that was Jock Simpson in 1907. John Morrison is the next in this series of prominent players from 1907, and I have to say he is one of my pet favourite players in the history of Falkirk FC. Although he would be special because [as far as I am aware] he is the only player to play for the club in every single position of the old 2-3-5 formation [okay he only played in goal once, in a friendly v Peebles Rovers]: but most importantly, by 1910 he went by the nickname "Slasher", there, that is enough. 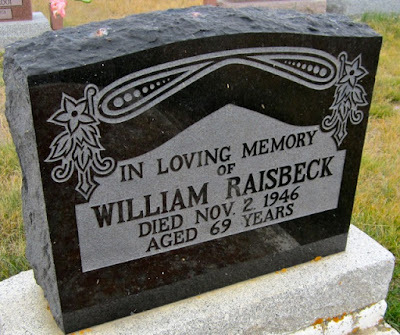 He would have been a 'one club man' apart from the fact that his work took him to Paisley, and wartime restrictions on movement compelled him to play for St Mirren in 1913/14. After his playing career he became the Secretary/Manager of East Stirlingshire, Third Lanark then St Mirren, retiring in Paisley during the second war. Today we have the legendary Clydesdale Duncan Skene [for that was his full name], from Tryst Road, Larbert. 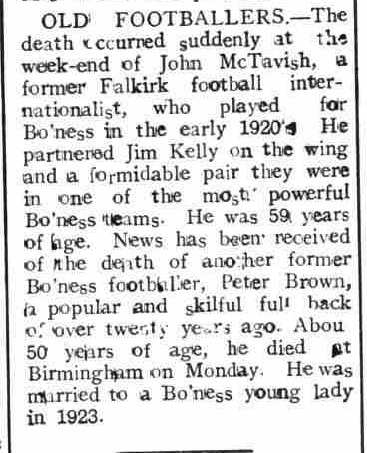 The Skenes were a sporting family Clyde also playing in the local cricket leagues, whilst his brother Dr Leslie Skene was a senior goalkeeper for [among others] Glasgow University, Falkirk Amateurs, Stenhousemuir, Queen's Park, Fulham, Glentoran and Scotland. I just found a picture of Robert Orrock at the start of his senior career, he joined East Stirlingshire at the beginning of the 1906/07 season, and would go on and on and on and on. Soon after this Bobby Orrock joined Falkirk, got capped and played a lot of football before winding up his career back at East Stirlingshire. Last thing I know the Orrock family headed off down under, to enjoy a bit of sunshine.